Generally the traditional engagement ring style is a band with a diamond. Truckloads of these precious symbolic rings are purchased every year, but recently the trend to purchase a unique ring has made alternative engagement rings a hot commodity. What is an Alternative Engagement Ring? An alternative engagement ring is any type of ring that is not traditional; this could include a non-traditional metal, stone, style or combination of the three. While some women may prefer a traditional diamond ring, most men will discover that any unique ring they purchase which reflects their fiancée-to-be’s personal preferences will be the most treasured piece of symbolic jewelry she will ever receive. Deciding to purchase an alternative engagement ring opens the option for countless choices. By choosing this option a man will also notice that there are many positive advantages, with the most priceless advantage being an astonished and happy fiancée. Buying an engagement ring may be intimidating for most men; purchasing the right ring is a difficult process in several aspects. Salespeople in stores are often more detrimental than helpful, often aggressively pushing men to buy the biggest and most expensive ring in the case. This is one of the most important factors for men planning on purchasing an engagement ring. For rings with a simple band, sizing down is possible but may be somewhat costly. Rings which are specially designed may not be possible to reduce in size. Determining a woman’s ring size may be difficult, but there certainly are ways to discover this. Measuring another ring belonging to the woman with a piece of string is one way; simply contacting friends or family members who will be able to keep a secret is another way. Men whose girlfriends already know of the surprise may just be asked for their ring size. Some women may have sensitive skin; this is not usually something most women will announce. Men who are planning to purchase an engagement ring for their girlfriend may not want to ask and risk spoiling a surprise. Usually a woman’s friends will know if she has a skin sensitivity to certain metals. Gold and stainless steel are two safe substances for those with skin conditions. Pewter and sterling silver often are risky materials to purchase for an alternative engagement ring. 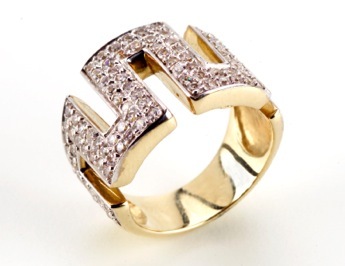 Some women may be particular about the style of ring, size of stones or types of metals they prefer. Before buying an alternative engagement ring it is important to find out if the woman has any specific preferences. Women who do not voice their preferences may be more difficult to shop for. Usually by observing their tastes and preferences, a man will be able to determine a style of engagement ring that will be suitable. For example if a woman loves Celtic jewelry, it is safe to purchase a ring with a Celtic knot and perhaps an emerald instead of a diamond. Women who adorn themselves with bulky jewelry will most likely prefer a thick band and catchy stone arrangement, while women who prefer dainty small pieces of jewelry will prefer a smaller band and stone. When men are in doubt about what type of stone to choose for an alternative engagement ring, they may be able to choose the woman’s birthstone or a combination of her birthstone with the birthstones of people who she is close to, such as children, parents or grandparents. Men shopping for an engagement ring will be met with plenty of alternative choices. Sometimes it is better to have an idea of preferences among the type of alternative ring desired before leaving the house. Sometimes a man may elect to create his own design to impress his girlfriend. Designing a band with intricate details and special stones is something that will leave a lasting impression upon most women. With ample notice, jewelers often are happy to design a special ring for a set price. The traditional diamond engagement ring is usually cut as a solitaire, princess, marquis or diamond shape. For a unique look, a man may pay extra to have a diamond cut in a special shape. Hearts are a popular stone shape for alternative rings. Another option is to use a combination of shaped diamonds to create a personalized object. For example, a woman who collects butterflies and is passionate about them may prefer a diamond ring with stones arranged to make a butterfly shape. This is usually the defining factor of the most highly sought alternative engagement rings. Many women prefer a colored stone or several small diamonds surrounding a large colored stone. Birthstones are a popular choice for an alternative engagement ring; also stones matching a woman’s favorite color are commonly sought. Another choice in this category is the lab-created colored diamond. A natural colored diamond is very rare and the price range is more than most average people can afford, often reaching well above $15,000 for a small stone. Lab-created diamonds are real diamonds, but often less expensive for the simple fact that they are not mined. The strength and durability of a properly-created lab diamond is equal to a natural diamond. Usually the coloring of a lab-created diamond will be slightly different than a natural diamond, but these stones make an excellent and beautiful choice for women who want to be unique. Colored diamonds are commonly found in blue, yellow and pink. Another choice for a unique engagement ring is an intricate band. Sometimes a band with an elaborate and detailed design may be chosen. Small stones may be added to the band for extra personality and sparkle. In choosing a unique band with an intricate design, it is crucial to be certain of the woman’s ring size. Rings that are specially crafted with a thick carved band are nearly impossible to resize without spending a small fortune. In some families a wedding, engagement or stacked ring is passed down through generations as an heirloom. This option is a common form of alternative engagement ring. Finding a vintage ring outside of one’s own family is not difficult. Some common places where people shop for these types of rings are usually the internet and antique stores. Rings which were worn by famous people are often sold and purchased as a unique engagement ring. Vintage rings include a wide variety of styles, stones and metals. Women who want to be sure to have a one-of-a-kind ring will be enticed by the idea of a vintage ring. Men who have a specialized design which they created themselves will most likely need to contact a reputable jeweler to create the design. Usually chain stores found in the malls are not likely to agree to a special design, however some may do the job for the right price. The internet is another place where people commonly shop for rings. Sites such as Amazon and eBay are very popular places to attain an engagement ring. When shopping online, men should be sure to purchase the ring from a reputable person in the United States. Dealing with foreign sellers may result in a poor quality ring with faux stones and materials. Those who plan to purchase a very expensive ring should be certain that the seller is including a certificate of authenticity and warranty for the ring. Upon receiving the ring, the item should be taken to a trusted jeweler and inspected for authenticity. Usually a consumer has about 30 days to file a formal complaint of fraudulent sales on the internet for large purchases without major difficulty. When shopping in a jewelry store, men should be certain to choose a reputable jeweler. Jewelry stores often set very high prices on their products. Most jewelers will sell a ring for up to 300% of what they paid for it. Shoppers should even beware of a 75% discount, as any sale will still yield an enormous profit on behalf of the jeweler. Men who would rather not pay such a high price should shop at a wholesale outlet for equal quality and lower prices. For those who do not have a specialized design in mind, a wholesale outlet will provide plenty of pre-made options. Designer rings are usually not available at outlet stores, so this option is best for men on a budget who have an idea of what they want but do not want a designer or a self-designed ring. Because there is a wide array of alternative engagement rings to choose from, pricing will differ greatly, often ranging between $100 and $10,000. 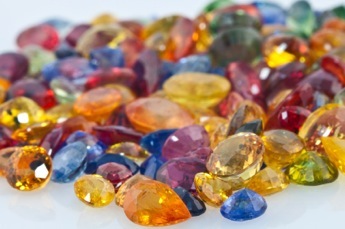 Some gemstones are much more expensive than others because of their rarity. Black opals, blue garnets and jadeite are examples of gemstones that are extremely expensive. Generally the more pure a stone is, the more expensive it will be. In order to find the right ring, it is best for a man to tell the jewelry store attendant what size, shape and color of stone is desired, along with what type of metal. To avoid being overcharged, men should suggest a total spending allowance about $300 less than what is planned since most stores will suggest something more expensive.